I had an evening this week when I was too tired to do anything, but too wired to sleep. So I spent 99 minutes in mindless entertainment. The message seems to be that the mean and venal will prevail. 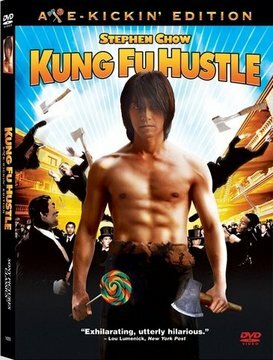 It was that classic martial arts movie, Kung Fu Hustle. Stephen Chow does it again. I enjoyed his Shaolin Soccer, so thought I'd give this movie a try. Totally over the top. Sing, a petty street hustler and his friend want to join the notorious Axe Gang, a large urban gang of thugs who wear tuxedos and kill with axes. They are pretty cold blooded, which is amply demonstrated in several scenes in this movie. When Sing and his friend try to shake down the town of Pig Sty posing as Axe members, it focuses the attention of the real gang on this impoverished town. Coming to the town's protection are a series of Kung Fu masters. The first doing pretty cool martial arts stunts, but as the movie goes on, they display more and more superpowers. The plot is pretty cheesy, the acting hammy, the special effects okay, and way over the top. In short, it's great entertainment. "When a man steals your wife, there is no better revenge than to let him keep her." --David Bissonette. "After marriage, husband and wife become two sides of a coin; they just can't face each other, but still they stay together." -- Sacha Guitry. "By all means marry..If you get a good wife, you'll be happy. If you get a bad one, you'll become a philosopher."--Socrates. "Woman inspires us to great things, and prevents us from achieving them."--Anonymous. "The great question...which I have not been able to answer... is, 'what does woman want.'" Dumas. "I had some words with my wife, and she had some paragraphs with me." --Freud. "Some people ask the secret of our long marriage. We take time to go to a restaurant two times a week. A little candlelight, dinner, soft music and dancing. She goes Tuesdays; I go Fridays." --Anonymous. "There's a way of transferring funds that's even faster than electronic banking. It's called marriage." --Sam Kinison. "I've had bad luck with both my wives. The first one left me. The second one didn't." --James Holt McGavran. "Two secrets to keep your marriage brimming. 1) Whenever you're wrong, admit it, and 2) Whenever you're right, shut up." --Patrick Murray. "The most effective way to remember your wife's birthday is to forget it once." -- Nash. "You know what I did before I married? Anything I wanted to."--Anonymous. "My wife and I were happy for twenty years. Then we met." --Henny Youngman. "A good wife always forgives her husband when she's wrong." --Rodney Dangerfield. "A man inserted an add in the classifieds: 'Wife wanted'. Next day he received a hundred letters, all saying the same thing: "You can have mine." --Anonymous. First guy: "My wife's an angel." Second guy: "You're lucky. Mine's still alive." Women, of course have their own slant on things. Yesterday, I wrote about what I did Friday, so it's only fitting that today, Sunday, I'd tell you about Saturday, February 2, the day Michael Feldman brought his "Whad 'Ya Know?" to the Florida Theater. This beautiful old theater is listed in the National Register of Historic Places, and has been an entertainment venue since 1927. Saturday is my favorite day for listening to WJCT, NPR's local station. It starts with Car Talk, going into "Wait..Wait, Don't Tell Me", then Michael Feldman, followed by "This American Life". A great broadcasting day. As a First Coast Society member, I got advance notice to the live radio performance, followed by a VIP reception. I ordered two tickets as soon as I made sure I could clear my schedule for that day. One of my dance instructors, Tom, who is an NPR fan, had a birthday the end of January, and I asked him if he wanted to see Michael Feldman as his birthday present. Which is how we found ourselves driving the one-way streets of downtown Jacksonville in a nearly futile search for a parking spot. We finally pulled into a lot that charged $10, and still left me holding a citation after the show. We had to stand in line (a long line) to pay by credit card. I had to key in the parking space number, and then the display said "take receipt". So I grabbed the receipt and we went to the theater. I totally missed the small print that said "display on dashboard." Oh well. Calling to contest it will give me something to do the next time I have a couple of free hours. Our seats were in the second row, directly behind three seats that were no-shows. Or they hadn't sold them. I don't know, all I know is that there was no one sitting in front of us. 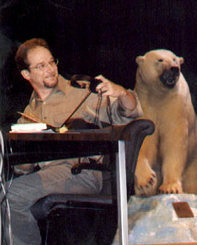 The stage in that beautiful old theater was liberally decorated with Florida memorabilia, including a sunbathing pig, a stuffed emu, and some gator stuff. Feldman, who looks just like he sounds, warmed the audience up starting about 15 minutes before program time. He seemed to genuinely enjoy himself, which made it lots of fun for the audience. He wore a U of Florida Gator shirt, which delighted about half of those present. He sang "Don't be Cruel". (The Florida Theater was the site of one of Elvis Presley's first shows.) He had a good time, we had a good time. Announcer Jim Packard later got to try singing a bit of Elvis, fortunately during a station break, when we were not actually on the air. When he asked "Whad 'ya know?" we were instructed to respond "Not much, Y'ALL"
The contestant taking the quiz was smart and funny as well, though she showed some of the oblivion these contestants do demonstrate...an inability to recognize when Feldman is trying hard to steer them to the right answer. Ultimately, they did fine and won the prize. Then he walked around the aisles interviewing random folks, and answering questions that had been submitted by the audience. He interviewed Mark Woods, columnist for the Florida Times-Union, mostly about the recent political primary. Later he interviewed a J.T. Touchstone, a young man whose job it is to capture nuisance alligators. It was interesting to note that he had all his arms, legs and fingers. He was pretty young, though. He said the biggest gator he'd caught was about 13' long, and that he then skins the gator, and takes the head, feet and meat to sell. When asked about the feet, he said they are used to make back-scratchers. That'd be a nice little conversation piece. His last interview was with Joan Peoples, an owner of Clark's Fish Camp, who admitted that she probably bought alligator meat from the previous guest. She brough samples of rattlesnake, gator, eel and antelope for Feldman to try. He nibbled, but Clyde Stubblefield left his drum set to come forward and sample most of the delicacies, though none with huge enthusiasm. Plates of tidbits were passed around the first few rows. A musical interlude by local songstress Rebecca Zapen was a wonderful surprise. She is a classically trained violinist with a sweet, pure, clear voice. She and her band did a couple of numbers, the second of which she wrote about her sister, Andrea. The second quiz contestant was a guy with two first names (Tony? Steve), who is a musician, and in fact had been a studio musician for Rebecca Zapen's first album. Fate or coincidence. You decide. He was also pretty entertaining, and he and his telephone partner did well on the quiz. Afterward, we went upstairs to a very nice reception buffet, with a variety of salad and sandwich offerings. Dessert was goodies from Peterbrooke Chocolatiers. So good. I had a big chunk of their chocolate-covered popcorn. To die for. Chased down with a couple of good lagers. Thanks, Laura. 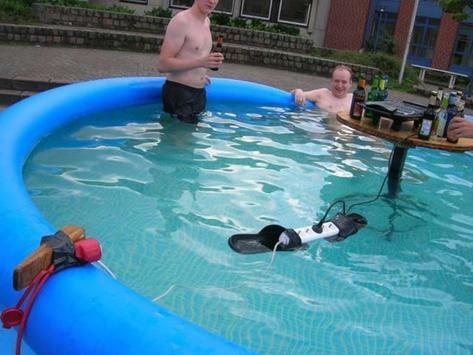 I hope that's a joke and not a live wire. Dee Ray knows how tone deaf I am when it comes to sports. He's helping out with this joke. Three quarterbacks, Peyton Manning, Tony Romo and Tom Brady go to Heaven to visit God and watch a Celtics game. God decides who will sit next to him by asking the boys a question. God asks Peyton Manning first: "What do you believe?" Manning thinks long and hard, looks God in the eye, and says "I believe in hard work, and in staying true to family and friends. I believe in giving. I was lucky, but I've always tried to do right by my fans." God can't help but see the essential goodness of Manning, and offers him a seat to his left. Then God turns to Tony Romo and says "What do you believe?" Tony says "I believe passion, discipline, goodness and honor are the fundamentals of life. I too have been lucky, but win or lose, I have always tried to be a true sportsman, both on and off the playing fields. God is moved by Romo's sincere eloquence, and offers him a seat to his right. Finally God turns to Tom Brady "And you, Tom, what do you believe?" Brady replies "I believe you're in my seat." 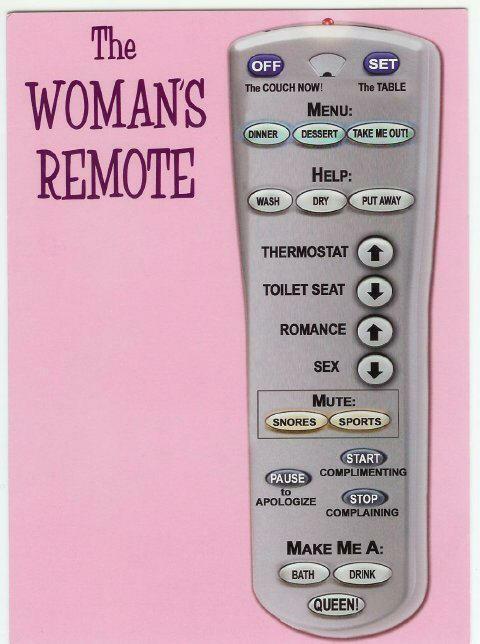 In a post on gender and language the other day, I shared that the remote was female, because it gives a man pleasure, he'd be lost without it, and while he may not always know which buttons to push, he just keeps on trying. I've been having a stressful week. I was in the office today dealing with potential disgruntled postal workers (figure of speech, but you know...) when my secretary came in and dropped this on my desk. The first part is sort of pop-psych. The others are pretty funny, mostly familiar, a couple I hadn't heard. All of it is edited to my taste. A lecturere explaining stress management raised a glass of water and asked "how heavy is this glass of water?" After getting a few dumb answers, he told the audience that it doesn't matter. What matters is how long you hold it. If you hold it for a minute, no problema. For an hour, it makes your arm ache. A day and you'll call an ambulance. A lifetime...oh, wait, he didn't say that. In each case, the weight is the same, but the longer you hold it, the heavier it becomes. "And that's the way it is with stress management. If we carry our burdens all the time, sooner or later, as the burden becomes increasingly heavy, we won't be able to carry on." "As with the glass of water, you have to put it down for a while and rest before holding it up again. When you're refreshed, you can carry on with the burden." He added that before going home from work, you should put the burden of work down; don't carry it home. You can pick it back up tomorrow. Meanwhile, you can kick the jerk out for a few hours. Oh, wait, that's not what he said. I'm pretty good at compartmentalizing. Usually when I go home, I blog or cook or watch a bit of TV or a movie, or read, and forget about the day. I have colleagues who can't let it go, and every day, I look at them and wonder how they get themselves so stressed, if they're going to have an early heart attack or stroke. I try not to add to their stress. Really. But you don't even have to try. They seem to interpret everything as a stressor. So here are a few platitudes that sound deep, even if they're not. -Accept that somedays you are the pigeon/windshield, some days the statue/bug. -Always read stuff that will make you look good if you die in the middle of it. -If you can't be kind, at least have the decency to be vague. -If you lend someone $20 and never see that person again, it was probably worth it. -Never put both feet in your mouth at the same time, because you won't have a leg to stand on. -The second mouse gets the cheese. -When everything's coming your way, you're in the wrong lane. -Birthdays are good for you. The more you have, the longer you live. -Some mistakes are too much fun to make only once. If your man's a few grunts short of Neanderthal, here's a book that can make him into a more manly man, more like the guys back when men were men and sheep were afraid. 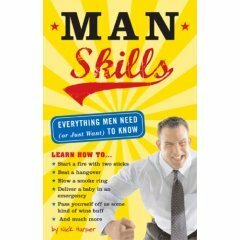 Man Skills by Nick Harper teaches your man (or you) how to do the really important stuff (forget balancing the checkbook, doing laundry or salvaging a lost computer file) like how to carve a turkey, blow a smoke ring, start a fire with two sticks, undo a bra with one hand, survive in prison. Okay, some of these I really don't need. Some I can use: How to jump-start a car, unclog a toilet, deliver a baby in an emergency, beat a hangover (yes, I confess I could use that now and then). 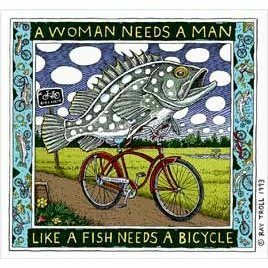 It may be tongue in cheek and fun to read, but there are some pearls here. So give it to your husband for his next birthday, since you can't figure out what to get him anyway. Then buy yourself a Victoria's Secret bra for him to practice on, and a carving knife, and you're all set. He needn't know that you're reading the book too.